Small business billing software is as important to a small business as gigantic ERP software is to a large corporation. While large corporations (over 100 employees) will probably source their software among large ERP solutions like PeopleSoft, Great Plain, MAS, and others, EnterYourHours.com can provide most of these core small business billing functions to small and medium businesses. Small business billing software requires an efficient work-flow process. Often a single billing administrator, or company owner, will handle all of the hourly billing for his/her entire company. Aggregating workers billing hours, across multiple clients and projects can be a headache and if your small business billing software doesn't appropriately track the hours billed and paid, then clients are likely to be double-billed or not billed at all. Additionally, small and medium businesses need to have flexibility when billing clients. Businesses of this size need to be nimble, and can't be forced into a rigid billing method. Sometimes a company owner might want to hold off billing for a couple of days because a big client's project is not quite finished. 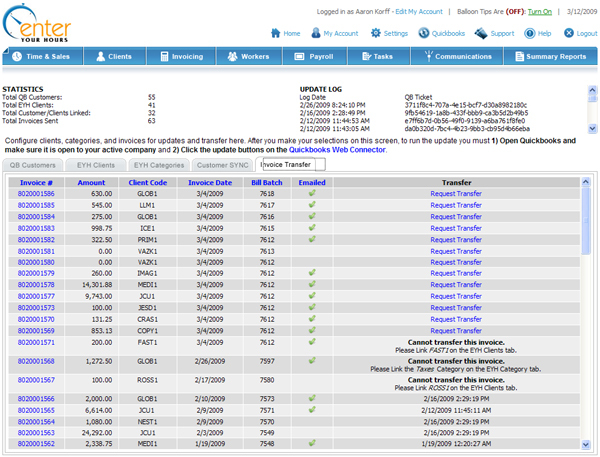 EnterYourHours.com gives your powerful control over your billing procedures by using bill batches. There are, however, situations where billing consistency is important and small business billing software should provide a way for repetitive tasks or categories of tasks to be billed in particular ways. There are cases where a service charge needs to be billed on a regular basis, such as weekly or monthly. EnterYourhours.com allows you to schedule recurring billing. Additionally, you can assign special bill rates for particular duties, and upon entering hours, any worker can choose the correct duty so the correct bill rate is applied on invoices. Small businesses are especially sensitive to perceptions about their professionalism. EnterYourHours.com allows small business to configure their invoices in a variety of customized ways, including showing their logo, configuring columns, and grouping aggregates by duty, project, worker, and/or day. Invoicing can then be sent via email automatically using a pre-programed email template, or saved and printed. Many small businesses use Quickbooks. EnterYourHours.com is a certified Intuit Silver Developer and EnterYourHours.com has been approved for Quickbooks Integration. The integration interface is easy to use. Within minutes you can have all of your EnterYourHours.com client in Quickbooks, or load your Quickbooks customers into EnterYourHours.com. Every time EnterYourHours.com creates a new invoice, you can immediately transfer the invoice into Quickbooks. There are many more features of EnterYourHours.com, your best small business billing software solution. To learn more, you can view our New User Center, or take one of our product tours. EnterYourHours.com does not require any installation and runs entirely in your browsers, over secured, encrypted connection, so all legal obligations to your clients are met. Sign up for our fully functional 30-day free trial and try it out.